The title of this blog, Die Krankenschwester (kron/ken/shwes/ter) translates to The Sick Sister. It is the German word for nurse. This blog begins with the question: Has media representation of nurses affected their identity? Explored through posts using visual art and sometimes essays, the posts are not authoratative declarations nor draw conclusions about nurses or nursing. They’re more about art and observation than science, although Die Krankenschwester is an experiment. The following notes are by no means intended as a rule of thought by which nurses can teach themselves to nurse, still less as a manual to teach nurses to nurse. They are meant simply to give hints for thought to women who have personal charge of the health of others. Every woman…has, at one time or another of her life, charge of the personal health of somebody, whether child or invalid,- in other words, every woman is a nurse. Is every woman a nurse? Not all nurses are women. J. Paradisi RN, OCN finds inspiration where science, humanity, and art converge, creating compelling images. She is a visual artist, and a writer. She studied fine art at Pacific Northwest College of Art.Besides Die Krankenschwester, she also authors the blog J Paradisi RN. A nurse for twenty-four years, she has worked in Pediatric Intensive Care and Neonatal Intensive Care in Level I Trauma centers and level III Neonatal units in California and Oregon. She currently works in Adult Oncology. If you read Julianna Paradisi’s blog, you probably know that she’s been a pediatric intensive care nurse and now works as an adult oncology nurse. She’s also an accomplished painter with numerous group and solo shows to her credit. (I’m especially partial to the Greetings from Slabtown series, which depicts decaying buildings from an industrial area in Portland, Oregon.) 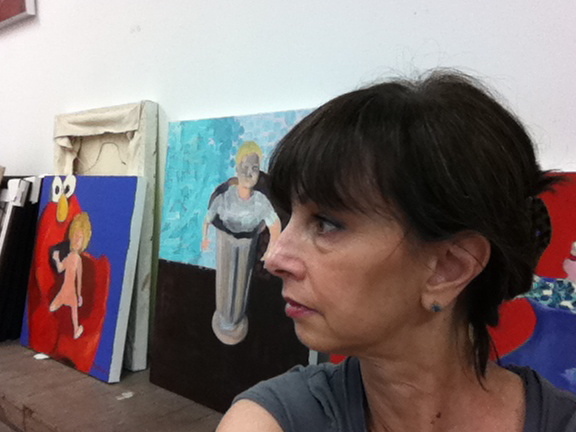 She blogs about health care and art, and sometimes, on how these intersect. In On Art and IV’s Part I she tells us, “I have an affinity for privacy,” then considers the difference between charting and writing; in Part II, she writes about bringing focus and conviction to bear in one’s work. As the coordinator of AJN’s Art of Nursing department, I’m intrigued by intersections between the two fields: Art and Nursing. About a year ago I profiled several multitalented nurses (The Triple Talents of Some Nurse Bloggers), including Julianna Paradisi, an RN, artist, and writer who blogs about “where science, humanity, and art converge” at JParadisi RN’s Blog. (Her painting Love You to Death appeared on our October 2009 cover.) In March Paradisi launched a second blog, Die Krankenschwester, which emphasizes images. One series depicts rituals followed “From Cradle to Grave”; another considers the iconography of call lights. Paradisi’s work is beautiful and thought-provoking; stop by and have a look. Julianna is a contributor of essays and artwork to The American Journal of Nursing, and the AJN blog, Off the Charts. Scrubs Magazine published her newest series of paintings Vessels of Containment: Part I on their website, and a prior series From Cradle to Grave: The Color White in the Fall 2011 print issue. Kaplan Publishing included two stories of Julianna’s in the anthology New Lives: Nurses’ Stories about Caring for Babies, edited by Kathleen Huggins, released nationally in May 2009. Besides writing about nursing, she writes about art and is a contributing writer for pdxArtscene. showcases her work as a visual artist. I ordered and just received “Love you to Death!” Can’t wait to get it framed and slap it on an appropriate wall in just the perfect spot! I was meant to see “Love you to Death”. Kudos to you for following your dreams and enchanting me with your creativity. I am a Critical Care Nurse and have finally grown to love it. It was not love at first sight. It wasn’t the nursing I didn’t love, it’s that I gave up my childhood dream to do it. I was a thoroughbred racehorse jockey for over 10 years. Giving that up was the hardest thing I have ever done.